to train a horse. I think a horse and man are a team, without one the other did not do good. Jacob chose Colter as his horse for the challenge! I am a graduate of Oklahoma State University with a BS in Animal Science. I was also on the OSU Big 12 Equestrian Team from 2004-2006. Growing up I showed and trained all of my horses in all around events in Wyoming and Oklahoma. eventually turned into much more. I earned 3 Reserve World Championships in Roping and competed in barrel racing at hundreds of rodeos/jackpots and the Pinto World Show. I currently have a 6 year old cutting bred mare named “Ichi”. I trained her on the barrels 5 months ago and have been successful with minimal competing. 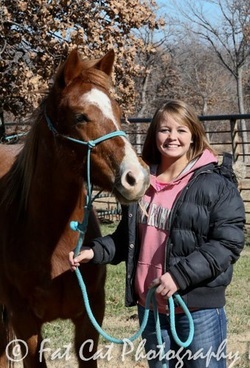 Currently I am training her on the poles and our goal for 2013 is to qualify for the AQHA World Show in Pole Pending. I enjoy getting a horse with a clean slate. Molding their minds and guiding them to the abilities they are best at is what I thrive to achieve. My methods are simple, yet mind challenging to the horse so they learn to respond what we ask from them. Importantly, a horse needs to be safe for anyone. If the horse and rider both can be in sync with one another, the possibilities are endless! Anna chose Rocky as her horse for the challenge! Hayley pictured with Bell Boy. I was born in Edmond, Oklahoma and moved to Colorado when I was three. I later returned to Oklahoma in my freshman year of high school and began to learn how to ride and train under Terri Lindley in June of 2008. Since then I have learned with each horse I have ridden and begun to make a journey in my own spiritual life with each of these horses. I believe horses are incapable of lying and whatever a person is feeling will manifest itself in the horse's reaction. The bond with a horse is a journey built on mutual respect that grows through each challenge that is faced; it is a beautiful language and dance between horse and rider. By the end of the training journey, I intend to help the horse become safe and confident in itself and its rider in any given situation. I am now a student at UCO and will soon be transferring to OSU to finish a degree in Veterinary Technology. Hayley chose Bell Boy as her horse for the challenge! My name is Daniel Glasgow. I was born in Edmond, OK in 1995. I grew up around horses, and started riding them at the age of 4 years old. I live in Guthrie, OK and have lived there for most of my life. Horses have been a major part of my family’s life. My very first horse to ever train on was named Willow. Robert Hayes had worked with her previously, and under his eye I watched him and decided I wanted to do it myself. Willow liked to buck, which attracted me to her even more. I guess you could say I liked the challenge. Willow has become a trust-worthy, properly trained horse. It gave me a sense of accomplishment. 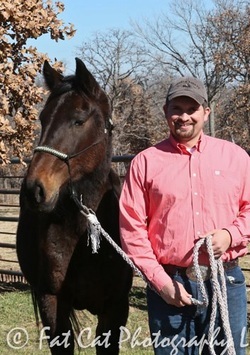 I started riding with Robert Hayes in January of 2012. 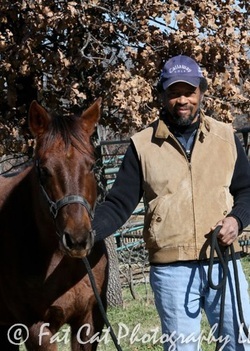 I have helped train many horses with him, including 2 of my personal horses. I continue to learn from Robert, and seek to learn more of his ways. Through Robert, I have developed a new passion for riding and training horses with this awesome experience I have been given. I met the Cross family through Robert. I worked with Dakota C. in the summer of 2012. After listening to the chatter of the Trainer Challenge in 2011, it sounded like a blast! From that point, I decided I would like to take a chance and see how my abilities can shine through training a horse completely on my own. I seek to learn techniques from other trainers, including the others participating. I hope to learn a lot from this experience and help the horse find the best possible home with its new found confidence and abilities. 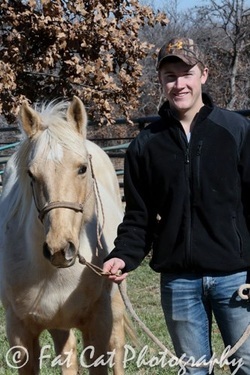 Daniel chose Dugan as his horse for the challenge! 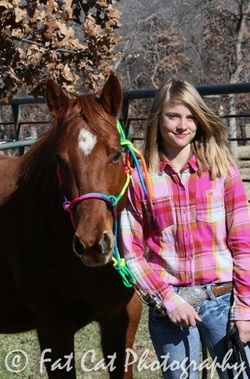 Like most little girls, ever since she can remember Kelci Lavelle Goad has loved horses…but it wasn’t until she was twelve years old that she started taking riding lessons. Time in the saddle and around the barn quickly became something she craved and going to the fifteen acre horse ranch located just behind her house in Hockinson, WA became a daily activity. 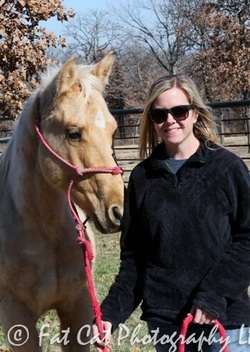 Kelci met her first horse, a Haflinger named Broadway Annie, there just hours after she was born. With the help of multiple different trainers, she went through Annie’s entire training process with her. From halter breaking to jumping under saddle, Kelci was by Annie’s side (and on her back) the whole way. It was during that time that Kelci realized not only did she love riding and being around the barn, but she loved to train. A passion that she’s pretty sure will last a life time. Kelci always strives to be as educated as possible about her chosen avocation and this has clearly been shown by her constant participation since age 12 in twice a week riding lessons, multiple clinics, 4-H meetings, daily practice, and even an intense training apprenticeship with professional trainer and barrel racer, Allison Vankoll during Kelci’s senior year of high-school in 2009. 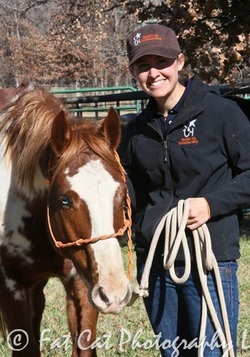 In 2012, Kelci graduated with distinction and honors when she completed her Equine Studies and Business diploma through the University of Guelph. Now she has jumped right in to her own business – Saddle Up Horsemanship. Kelci is a hard worker and always strives for excellence in all her equine-related endeavors. 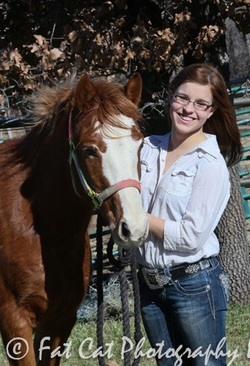 Most of all, Kelci just loves horses and the connection that we are able to have with them. Her passion has turned into a career and she is excited to see what is in store for her next. 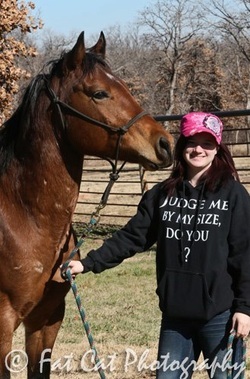 in the pasture or in the show ring. Kelci's sponsor is Barker Construction Specialties LLC! Kelci chose Kodak as her horse for the challenge! Robert chose Cidar as his horse for the challenge! 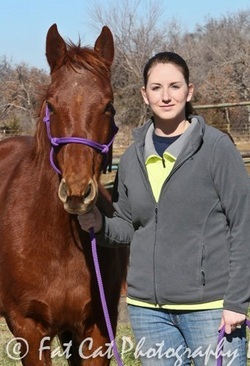 Terri chose Sable as her horse for the challenge! Nadia chose Groucho as her horse for the challenge! 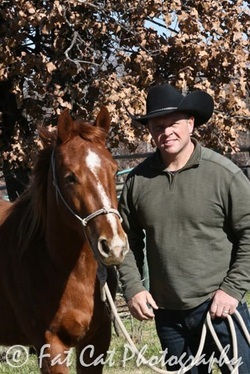 Just like every horseman, I was born with horses in my blood and started training for clients when I was 15 years old. When growing up I was fortunate enough to spend time in Colorado and Texas and took advantage of watching herds of horses interact with each other. That opportunity helped me to better understand horse behavior; leadership, trust, respect, and willingness, all which has helped me form the basis of my training. I have also added concepts from many clinicians as well, I use what works for me and what is applicable to each individual horse on that particular day. I have trained anything from Arabs and Morgans to warmbloods and drafts to thoroughbreds and Quarter Horses to mustangs and ponies and enjoy them all. I have not trained a mule but would someday love to! The majority of my training has been in cutting horses. I currently live in Moore with my wife and son, and have a daughter on the way! I train full time and specialize in starting 2 year olds and working with older horses with problems become willing partners again. I believe strongly in groundwork and a solid foundation. My horses graduate from the round pen to the indoor arena to the outdoor to the pasture to trail rides, and of course focusing on the horse's future career and helping the owner have a great relationship with their equine partner. 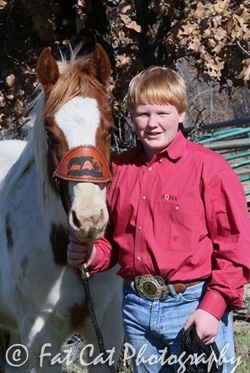 Jesse chose Tether as his horse for the challenge. However, once Jesse began working with Tether, he noticed him being "off." Upon further examination, it has been determined that Tether has EPM. He has been returned to Blaze's and has begun EPM treatment. Jesse chose another horse, Radar. We thank Jesse for noticing Tether had a problem and addressing it immediately! Emily chose Katy as her horse for the challenge! Angie's sponsor is Zeal for Life! 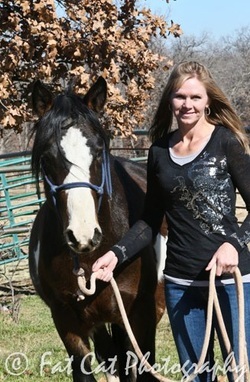 Angie chose Tug as her horse for the challenge! love they deserve as well as find their forever home. Aubree chose Latte as her horse for the challenge! horse and exert all my efforts into creating the best and most enjoyable riding partner I can. I train Western style and focus on training and building confidence in trail horses and starting young horses with the ground work and basics. My training methods are pressure and relief. I apply the pressure and they are rewarded with the relief once they correctly respond to what I am asking. Every horse I work with begins with extensive ground work if they don’t already have it. I believe an excellent foundation of ground work is a must before a horse is ready for a rider. If they won’t listen to you on the ground, they surely won’t listen to you while you’re on their back. 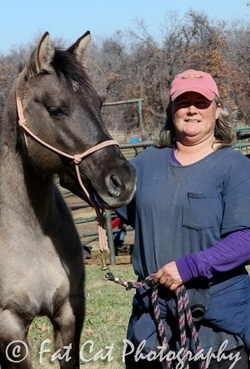 There are so many great horses within the program that it will definitely be hard to choose just one to help; I am very anxious to meet all of the rescued horses as well as their trainers. I am very blessed to be part of such a wonderful event and hope that my efforts will allow an unadoptable horse a second chance to be someone’s partner again. Shelby chose Pogo as her horse for the challenge! *We are happy to announce that Shelby and her husband are expecting a baby! After much consideration and advice from her doctor, Shelby has decided it is in their best interest to withdraw from the competition. However, Shelby has decided to adopt Pogo! She is so pleased with the progress he has made and wants to continue his training once she has her baby. Although we will miss them at the challenge, we are thrilled for Shelby & for Pogo! Jason chose Rosa as his horse for the challenge!